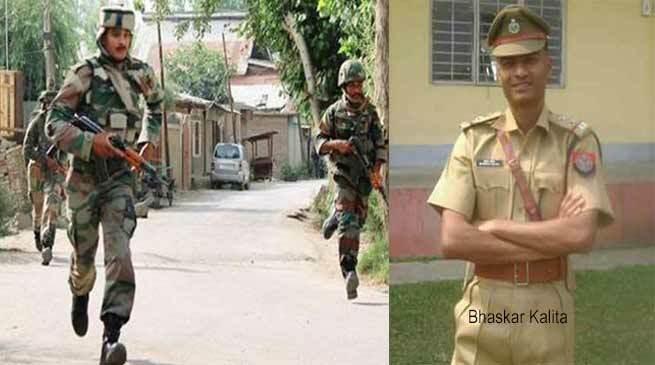 The Officer In Charge of Bordumsa police station , Bhaskar Kalita lost his life While two suspected ULFA (Independent) militants were reportedly killed in an encounter with ULFA (i) rebels along the Assam-Arunachal border in Assam’s Tinsukia district on Friday. According to Source, an encounter have been reported between a joint Army and police team and suspected ULFA(I) militants at Kujupathar, Konapathar and Khermethia areas along the Assam-Arunachal border in Tinsukia district Friday evening. Sources further said that the Officer in Charge of Bordumsa PS Bhaskar Kalita, who has received bullet injuries lost his life. There are also reports of two grenade blasts amid the heavy exchange of firearms. The OC , Bordumsa, Bhaskar Kalita lost his life in the encounter. Two ulfa cadres killed by the security forces in the encounter. Two women cadres of ulfa nabbed by police. Seven member group of ulfa cadres involved in the encounter.